We’ve all had those days where we sit around and do nothing except veg out on the couch. It’s nice to do once in awhile, but if you find yourself doing only that, then it might be time for a change. 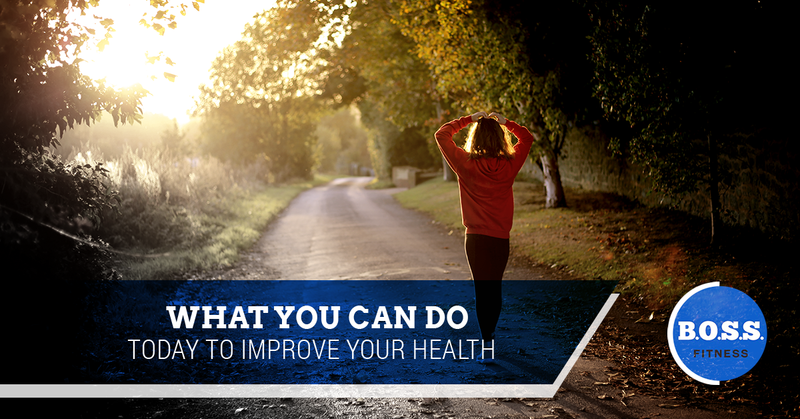 By taking the time to improve your health, you’re able to increase your quality of life. For example, if you don’t take the time to go to a fitness center or engage in any exercise classes, then you’re not able to strengthen your body, which can hurt you down the line. Exercise, eating right, and drinking water help to improve how you feel each day as well as help your brain function better and stronger. Getting in shape now and being healthy will improve the way you feel in the long run. Don’t just sit on the couch and veg out, take the time to start living your life by improving your health. If you’re wondering what you can do today to improve your health, then you’ve come to the right place. We all say that we’re going to start being healthier tomorrow or next week because it’s in the future and we don’t have to deal with it now, but these five methods will help you get on the track of improving your health today instead of waiting until tomorrow. Take the initiative in your life by starting small today to get your health on track. If you have any questions about how to get into better shape, eat healthier, or start exercising, then stop by our fitness center to meet with one of our personal trainers. Improving your health doesn’t have to start with a five mile run and only eating kale smoothies. A great first step toward improving your health is to drink more water. Yep, that’s it! Just enjoy a few glasses of water a day and slowly start to eliminate sugary pop, juices, and cut down on the amount of alcohol you drink. By incorporating more water into your diet, you’ll notice a difference in your skin, in how you feel, and you’ll begin to lose weight because you aren’t drinking your calories. Water is a source of life and your body needs it to function. Instead of drinking a sugary pop at two o’clock to get you through the remainder of the day, start to drink some water to get your brain functioning higher and better. Water can help with headaches, pains all over your body, and aches that you may have sustained when going to your first fitness class. Like we said, starting small is the best way to begin to improve your health. Instead of hopping on the treadmill, take a brisk walk around your neighborhood or in a park near your home. A brisk walk can be just as good for you as other forms of exercise. Walking works your heart, it allows you to take in the beauty around you, and if your pace is brisk enough you’ll find that you feel just as tired as you would after a run. If you take a walk in nature you get even more health points because you can breathe deeper and get more oxygen since you’re surrounded by fresh air. Another way you can improve your health is by incorporating more fruit into your diet. When you eat more fruit, you’re getting a lot of nutrients that can fight diseases and help your brain function stronger and better. A half a cup of grapes, raspberries, blackberries, blueberries, strawberries, or an apple, banana, or a nectarine, if it’s summer, will be a great addition to your lunch. Fruit can also help eliminate any cravings you may have for a piece of chocolate or a cookie after a meal. Instead of getting your sweet intake from a serving of cake or a pastry, enjoy eating a piece of fruit chalk full of vitamins. Along with incorporating fruit into your diet, start to add in some vegetables. You can do this a few different ways. Instead of eating chips when you find yourself hankering for a snack in the middle of the day, reach for some already sliced up vegetables and dip them into some delicious hummus. You can also start to eat a salad at least once a day with your meal or you can make a large super food salad for a meal. Eating large salads for lunch, dinner, and even breakfast if you’re feeling a little adventurous, will give you the energy to get through the day and boost your immune system. If you love meat, then add some steak, chicken, or pulled pork to your salad. If you’re a fish eater, then incorporate salmon, ahi tuna, or shrimp. If you are a vegetarian, then you can add even more vegetables such as beans and lentils to add a little texture. Adding vegetables to your diet can take place in several different forms and will help to improve your digestion, blood pressure, and help you lose weight. Lastly, step out of your comfort zone and try something new. From trying a new exercise to meeting a new group of people who enjoy getting into shape, trying something different that will allow you to access a new level of love for life. At B.O.S.S. Fitness, we offer a variety of exercise classes, personal training sessions, and events to get you out of your comfort zone. If you’ve never taken an exercise class before, then sign up for one. If you’ve always wanted to work with a personal trainer, but haven’t gotten the chance, then make an appointment. At B.O.S.S. Fitness we have a unique community that is full of energetic and fun-loving people. By coming to visit our fitness center, you’re trying something new to see if you’d like to live a healthier lifestyle. Start living the life you want for yourself by improving your health today.